The village of Tadoussac sets at the meeting point of a Fjord and a river, of fresh water and salty water. Therefore, it hosts a variety of species. 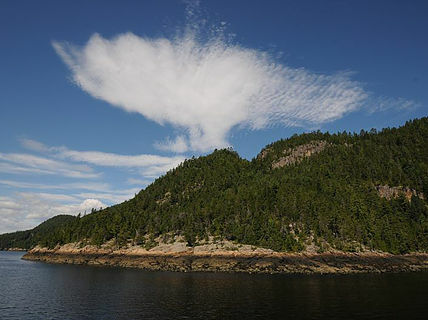 Birds and whales come here every year for the richness of its resources and food. Host of exchanges for centuries, from Natives to the first Europeans, Tadoussac remains a beautiful place where one can enjoy Nature. The Marine Park is a protected area and aims to maintain the abundance and diversity of marine species, to protect the endangered species and to promote the sustainable use of its resources. 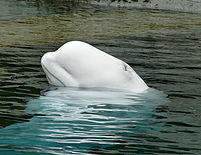 The Beluga Whale is the only species that remains in the Saint-Lawrence river all year round. Related to the seal and the dolphin, it measures between 3 to 5 meters and can weight 2 tons. This whale has teeth, mainly eats fishes and usually travels in herd. We can observe it in the Fjord and in the river. 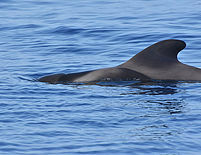 The Minke whale, measuring between 6 to 9 meters. It is the smallest specie in the family of rorquals – the baleen whales. We often see it feeding at the end of the Fjord. 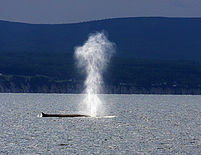 The Fin whale can mesure up to 21 meters and usually wheights between 40 and 50 tons. It’s the second biggest mammal in the world and can live up to 100 years old! 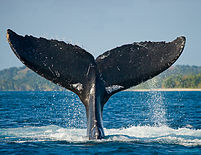 The Humpback whale got his name from the hump it got on its dorsal fin. It can measure between 11 to 13 meters and weights around 30 tons. Spectacular to watch, it jumps sometimes completely out of water (breaching)! The blue whale is the biggest animal that ever lived on earth. Il measures up to 20 to 25 meters and can weights up to 120 tons. Despite its extraordinary size, it almost exclusively eats krill and can take up to 4 tons of it per day! 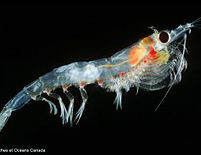 Krill is a small crustacean, similar to the shrimp, and it’s a kind of zooplankton that can be found in abundance in the St-Lawrence estuary. 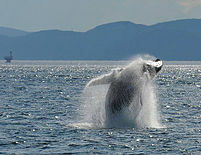 It plays an important role in the food chain and is partially responsible for the presence of whales in the area. The Harbor seal measures between 1.4 and 1.8 meters and can weight between 45 and 125 kg. It’s a permanent resident of Saint-Lawrence river and lives in herd on the land, although we can usually see him alone in the water. It’s rounded head looks like a dog’s head. 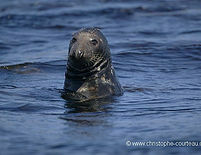 The grey seal usually measures 2 meters and weights between 95 kg and 310 kg. 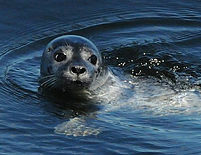 Like the Harbor seal, it mainly eats fishes and it can dive down to 500 meters. We can easily recognize his head, that is similar to the horse’s. 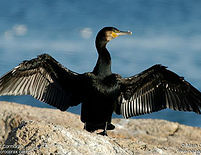 Great diver, the Cormorant has the particularity of not having impermeable feathers. That’s why we often see him dry his wings on the rocks before flying off. 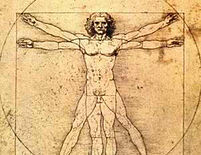 The human is the most intelligent specie of the galaxy. At the industrial era, he has severely unbalanced the earth’s ecosystem. However, he is showing more and more sensibility towards the beauty and the importance of Nature that surround it. 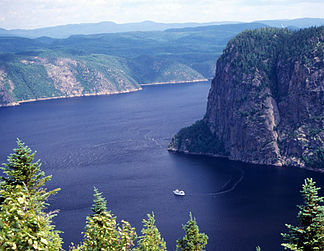 The Saguenay Fjord is a valley dug by glaciers nearly 10,000 years ago. 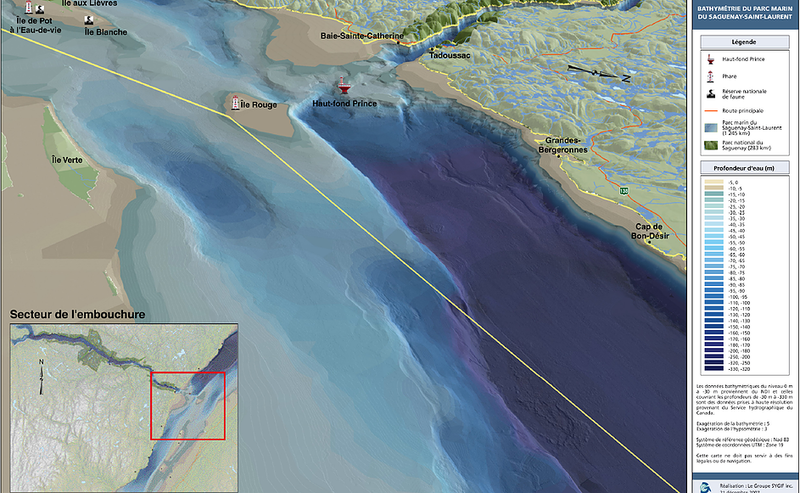 It extends over 100 km and can reach 275 m deep. 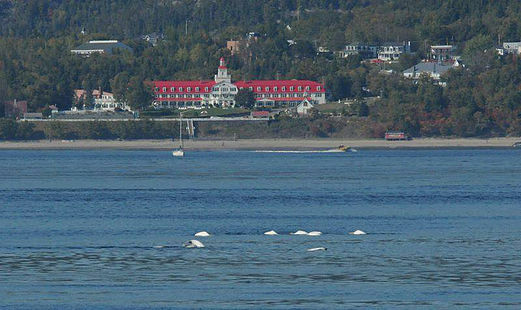 At the confluence of the Saguenay and the St. Lawrence, the pressure exerted by the rising tide allows seawater to cross the threshold of the fjord. 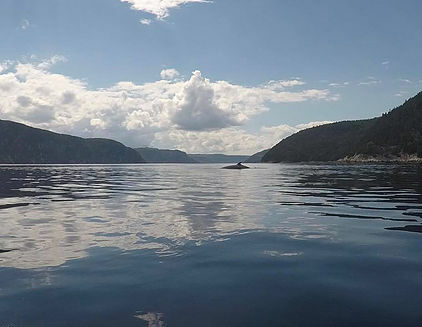 The introduction of cold, salty and well-oxygenated water brings the plankton into the fjord.